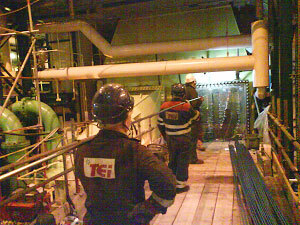 TEi Yimpact Heat Exchanger and Condenser services are one of the UK’s leading Main Condenser Condition assessment, inspection, refurbishment and full retubing specialists. TEi Yimpact Heat Exchanger and Condenser services have carried out 95% of all major condenser retubes within the UK in the last 20 years. TEi can offer a full refurbishment service of Power Plant HP Heaters, including complete retube in our Wakefield facility. 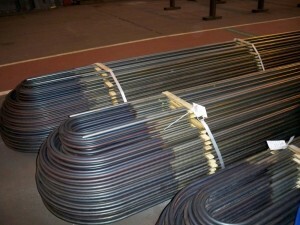 Full supply of replacement ‘U’ Tubes and tube end machining as required. 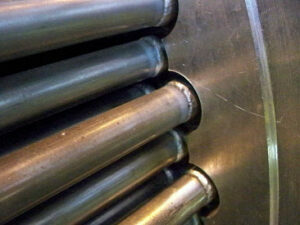 Machining and refurbishment of Tubesheets/Headers including reinstatement of “Castellation” feature for IBW. Over the period of their life, a proportion of Tubes will suffer from erosion/corrosion, flaws in the material, as the tube wall thins or dependent on the type of cooling water and chemistry. TEi’s High speed eddy current system can detect even the smallest of defects at an average rate of up to 5 tubes per minute for a 10 metre condenser. Our system uses compressed air to propel the eddy current probe through the tube at a rate of up to 6 meters per second. 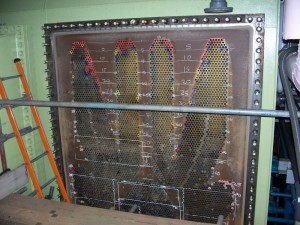 The computerized control system detects the end of the tube and automatically stops and reverses, being pulled back through the tube at a speed of up to 3 meters per second, whilst surveying the tube wall for defects and metal loss. The results are recorded using special software and are analyzed by our PCN Level 2 inspector in real time. Minimized inspection time leads to shorter outages. Probe insertion speed up to 22 ft/sec. Inspection of up to 8 tubes per minute (30ft/10m long). Uses a 4 frequency, simultaneous injection, ECT system with 8 standard channels along with multiple mixing channels. Using 4 frequencies eliminates false positives such as magnetic inclusions. I.D./O.D. defects are immediately distinguishable. Possible to inspect up to 2,000 tubes (10m long) in a normal working day using a single instrument. Manual and computer automated analysis is done on the spot. Over the period of their life, a proportion of Heater Tubes will suffer from erosion/corrosion, and tube wall thinning as a result of extreme temperature and pressure fluctuation, thermal cycling or water chemistry. 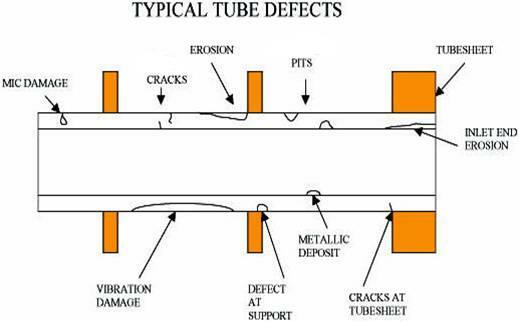 Generally, being of Ferrous materials, NDT tube inspection in a timely manner during tight schedule shutdowns is not considered. This often leads to costly forced shutdown or reduction in load when leaks materialize. 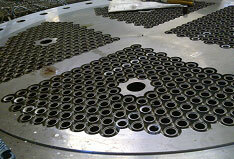 TEi’s DC Saturation Eddy Current Technique (MAGWAVE) was developed to quickly inspect ferromagnetic tubular materials from the bore of the tube. This technique was derived on the basis of conventional ECT utilizing the same inspection system and an external DC power supply, and automated software. As with the Eddy Current system, there is an option of utilising air assist probe driving system (PD-6K) may be used in conjunction for high speed transporting of the probe. By using four frequencies in a simultaneous injection mode, defects, such as: ID/OD pitting, baffle cutting, steam impingement and general wall thinning, can be detected and sized. With this option, inspection speed of 3 feet per second, up to 100 tubes can be inspected within an hour using the high speed system. MAGWAVE technique is not only effective in detecting general and localized wall thinning in carbon steel materials, but also in other ferromagnetic materials, such as Sea-Cure, SS-400 series and Duplex. The DinSearch 1-00 series modular equipment is specifically designed for the in-situ inspection of carbon steel tubes in heat exchangers, gas coolers and boilers, and has a range of larger inspection probes for use with larger diameter tubes. The system uses an established and proven electro-magnetic technique which will detect pitting, general corrosion, wear under baffle plates and thinning caused by erosion or corrosion; the defect most commonly occurring in steel tubular heat exchangers and boilers. 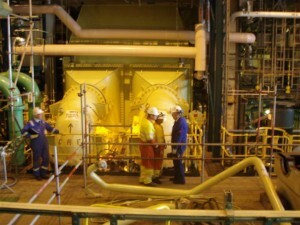 It will detect internal and external defects, but like other tube inspection techniques, will not necessarily detect leaks. With typical tube material, the equipment will resolve 1mm diameter pits and 2% loss in wall thickness. Inspection probes are available for tube sizes from 16mm to 75mm o.d. (5/8” to 3” o.d.) and for the normal range of wall thicknesses encountered in boilers and heat exchanger tubes. 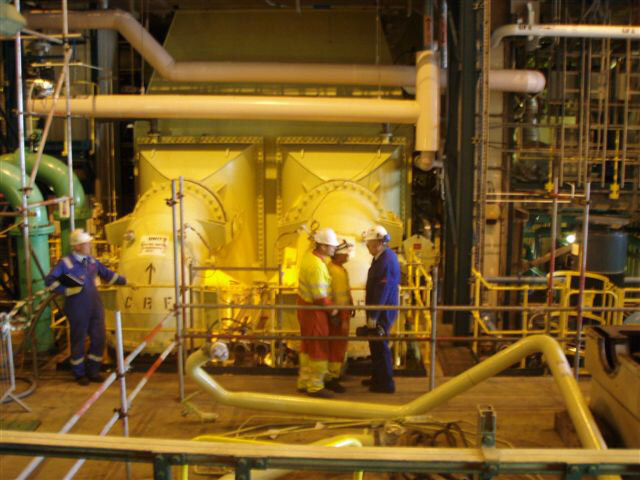 Heat Exchanger and Condenser services one of the UK’s leading Main Condenser Condition assessment, inspection, refurbishment and full retubing specialists.